In early September '09, I got the word that that an Allard P2 Monte Carlo saloon located in Wales was looking for a home. Its owner from 1982 had long term health problems and was re-locating to Malta, and was seeking a new home urgently. Back in the late '70's, at an AOC monthly club night at the George 1V, Portugal Street, London, a couple of lads appeared and were chatting about a certain P2 with a Cadillac engine that they were/had buying/bought. Why it stuck in my mind I don't know, as the love of my life at that time was 91L243/JLK958, soon to be swapped for 99J2138, the prototype J2X MGT 850. An owner of the J2X in the early '60's was Allard enthusiast John Williams of Swansea, South Wales, a Solicitor whose son, Roger happened upon my J2X at a Prescott meeting some 25 years ago and professed recognition of the registration number, but the body was a mystery (the car came to me with a Healey Alvis body, very similar to a Nash Healy). Roger was acting as the course Medic for the Hill Climb and was an enthusiastic Morgan Man! He enquired if the whereabouts of his dad's P2 was known. My reply was that, yes, I'd heard that it had been around some years earlier, but that was about it. In the meantime I managed to acquire the Godsal P2, another chassis with a late, no bell housing, 331 Caddy with 3 speed hydramatic, as per TGT703, but with its owner's own ideas of how such a car should look. A different story, with an as yet undecided ending! A quick ring around the Allard cognescenti determined that TGT was the 'Guvnor's daily hack and Allard Motor Company demonstrator from late '56 to early '58 when she was sold on to Eric Alexander (Lush, P 164,) who used the car for the odd sprint and shopping trip when he wasn't wreaking havoc with the now Tom Walker J2X (same picture). Eric held onto the car for 4 ½ years when it passed in to the hands of John Williams in September '62. John had a few cars as well as the Allard, so when it developed a water pump leak in '66 in was left in a corner whilst the Aston covered motoring duties. And so it sat until John's death in 1978, when John's widow requested her husband's partner to find homes for the small stable of cars. 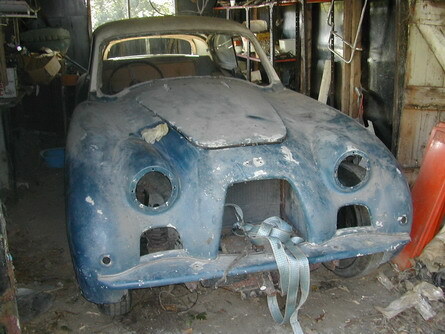 The Allard ended up with the local Dodge dealer for South Wales who did very little, apart from keeping the car in dry surroundings for 4 years, when it moved on to the gentleman from whom I bought the remains. Not long after his acquisition, a new marriage and new children stopped the strip process in its tracks, this in 1982, whereupon the car has sat undisturbed in a timber shed, beside a stream (which has on occasion flooded the garage, and washed away some foundations. Back to now! With the experience of the previous P2 project firmly in mind, it was decided that in all probability, the rear brakes would be firmly rusted solid (after 27 years) requiring the services of a small genny and disc cutter to chop the rear drive shafts in half. In the space of one hour, all 20 wheel nuts were free, copious squirts of WD40 applied thru any or all orifices in drums and back plates, and with the benefit of 4 wheels and tires brought with us for the occasion, we had the Allard P2 rocking freely, back and forth on its heels! Another hour was spent scouring the shed for a Allard parts that had found their way from the car, the decision was made to retire to the local motel for the evening, thence into Swansea for food and other forms of sustenance! The following morning, my helpers (Dave Richards, my best man, but I hold no grudge! ), and Tony Eaton (AOC Spares and Regalia no less) and I returned to the shed with two 4X4 vehicles, car transporter trailer and the Bedford Rascal (Isuzu mini van), and with surprising ease, TGT was dragged smoothly form its lair, winched upon the trailer, strapped down and hauled the 250 miles back to chez RME for deliberation. First thoughts: base of door pillars rotten (which is why the doors were not re-fitted), timber sills rotten, interior trim in super reclaimable condition, great body with the odd crack and ding, a sound chassis frame, all in all a very simple, (usually expensive!) restoration, using as many original parts that can possibly be salvaged. This car will NOT be winning any concours events, but it will be pretty much the same car that Sydney sat in/sat on, and will probably become the ultimate tow car for the rest of the Allard stable! Next week, free the Caddy motor, rebuild the carb and see if it runs. I'll keep you posted.